líc Pirátská lebka s osmi mečovými rukojeťmi, aztéckým okrajem a slovy "Praedatum in Mundo"
rub Stylizované ostří mečů s plameny a slova "Silver Shield 1/8 oz 999 AG"
Pirátská lebka s osmi mečovými rukojeťmi, aztéckým okrajem a slovy "Praedatum in Mundo"
Stylizované ostří mečů s plameny a slova "Silver Shield 1/8 oz 999 AG"
1 oz Stříbrný štít kousky osmi stříbrných mincí The new Silver Shield Pieces of Eight physically represents the deadly history of silver. 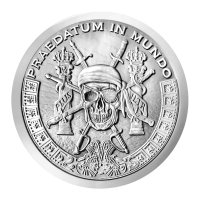 Praedatum In Mundo translates into “A Predatory World” that defines the struggle of man against nature to extract this rare, precious metal, but also violent clash of civilizations to control the treasure of the world. The ocean and sky in the background of the Silver Shield Pieces of Eight represent the treacherous seas that would claim many a men in search of this glorious treasure. The round has an Aztec inspired lower border that represents the powerful Native American empires that arose long before European discovery. The Aztecs, Mayans and Incas as well as many more Native American tribes conquered the Americas and spread their power throughout the Western Hemisphere. That is until another predatory power came to the new world... The Spanish Conquistadors brought Christianity, brutal tactics and most importantly disease to conquer the indigenous populations and steal their natural wealth. The eight swords of the Silver Shield Pieces of Eight represent the 8 great colonial powers that fought countless wars in dominating the world, Spain, England, France, Portugal, Denmark, Netherlands. This colonial warmongering continues to this day with the resource wars in the Middle East and Asia. No matter how powerful any one nation or empire is, on the open sea they were all subject to yet another predatory power, the Pirate. Despite the very bad reputation of the pirates, they actually had a very egalitarian code among them. It gives us a strong example of a true democracy that would put modern American democracy to shame. Pirates not only directly voted for their captain, but they also had the power to depose their captain at any time. Pirates also had a worker’s comp program that stated that if any pirate should become a cripple or lose a limb in service that they would receive 800 Pieces of Eight from the common stock. The Silver Shield Pieces of Eight was styled after the original Spanish Dollar or Eight Reales coin. Like the original Spanish Dollar, the twin pillars of Hercules are adorned with the early manifest destiny motto of the Spanish Empire, PLVS VLTR, or "further beyond". For many years of the early American history, the Spanish Dollar was used as an official currency of the new colonies. The original Spanish Dollar was a one ounce silver coin was valued at eight reales. This "piece of eight” could be fractioned into halves (four reales) or quarters (two reales) much as we do with modern dollars. These "pieces of eight” were also why the stock market traded stocks for hundreds of years measured in 1/8 until the decimalization in 2001. Like the original Spanish Dollar, the only way to cut the Silver Shield Pieces of Eight into it’s eight pieces, is a lot of effort and strong tools. Unlike the original Spanish Dollar, Silver Shield Pieces of Eight has a unique reverse that shows the purity and weight of the (8) 1/8 oz pure silver pieces of the 1 ounce pure silver strike. If you do manage to cut this into eighths, each piece of eight would have a unique colonial power sword on the obverse.